Imagine cooking perfect rice all the time that is a quality like of a restaurant rice but cooked it right at the comfort of home. Unbelievable? Well, actually it is possible with Zojirushi rice cooker. This is a no ordinary rice cooker because Zijorushi NS-LAC05XA uses the Fuzzy logic technology which controls the temperature of the rice cooker to let users cook any kind of rice, even rice like sushi, porridge, brown and white. Its front panel control has a colored LCD to display the timer and clock function. 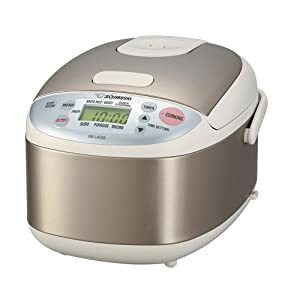 Cooked rice is always perfect and served hot all the time because Zojirushi rice cooker has an automatic warmer to keep the rice warm until you are ready to serve it. The NS-LAC05XA rice cooker and warmer measures 11.5” x 9” x 7.25” which can cook up to 3 cups of rice in its non-stick inner pan. Its compact size is perfect for small kitchens. The retractable cord and spatula holder keeps the rice cooker tidy looking. This 450 watt Zojirushi rice cooker and warmer is not only stylish in design with its clear coated stainless, but is also durable which comes with a 1 year warranty. I set the timer in the morning and the rice is ready when I come home from work. When I walk in the door, my apartment smells of cooked rice, — which is surprisingly pleasant. The timer is a must especially for brown rice which takes one hour and 40 minutes to cook. If I come home late, the rice is still okay since it automatically goes into a keep warm mode when the cycle is completed. The quality of rice and beans has been outstanding. Plus I can’t get over how much money I’m saving by not buying take-out, and I get to season the food to my liking. There is hardly any food that is cheaper, more comforting or nutritious than rice and beans, and you can keep the oil and butter to a minimum to keep the calories low while not feeling deprived. This entry was posted in food and tagged cooking, food by curiouscat. Bookmark the permalink.